The great community of the saints, both living and at peace, the church militant and triumphant, is the focus for the closing Badarak of the Easter weekend. Archbishop Nourhan is the celebrant this morning, and the duties normally reserved for deacons are assigned to four of the monks on this pontifical occasion. 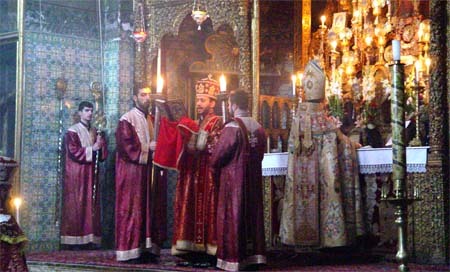 The overriding theme of the glorious community of the Risen Lord is evident when the opening rituals of the Divine Liturgy take place in the chapel of St. James the Greater (pictured above), where the elements of bread and wine are prepared and set aside to be transferred to the high altarof the Cathedral, later on during the Great Entrance, or offertory procession. The choir from Istanbul has opted instead to spend its last day in the Holy Lands touring the Galilee. Thus it is up to Fr. 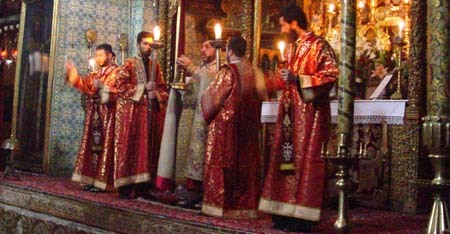 Goossan and the seminary choir, the normal configuration for music at the Cathedral of SS. James, to sing the Badarak for us this morning. Fr. Khoren, the young tenor whose singing dazzled us at the Easter banquet last night, sings the Gospel for the Badarak this morning. His gifts are particularly well suited for the vocal demands of the Armenian liturgy. The liturgy moves along with dignity and grace until we come to the time of communion, when the saints of God both seen and unseen gather for the supper of the Lamb. Immediately following communion, preparations begin for a festive procession of the saints around the Cathedral. 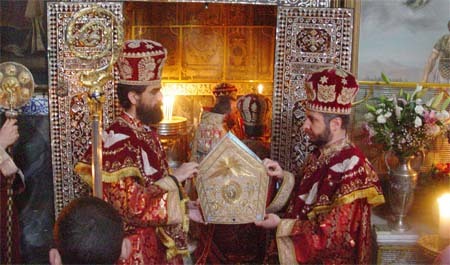 The monks robe for the occasion according to their order (bishops wearing the pallium over their copes) and most carry one of the many reliquaries in the monasteries collection. 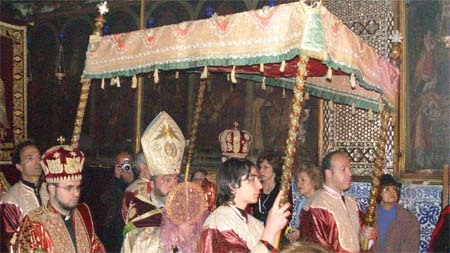 Several of the younger members from Armenian community of Jerusalem assist with the procession; and a canopy, also used during the Great Entrance or offertory procession, takes position at the end of the procession. 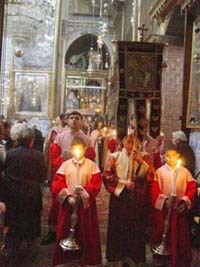 The most venerable and ancient of the relics, is a fragment of the Cross, which Archbishop Nourhan carries under the canopy in the procession, it is covered by light veil. Members of the congregation lean forward to reverence this and the other holy relics when they pass by. The bishops gather on the bema of the sanctuary for a final blessing to conclude this colourful and highly festive Easter Monday Pilgrims' Badarak. 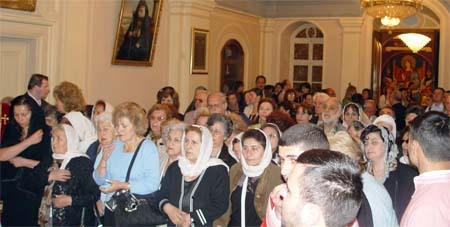 After the Badarak, the congregation follows the Patriarch to the great hall of his residence where he will offer a final farewell blessing for the pilgrims who have come to Jerusalem this weekend from all over the Armenian world. Seen in the photo (above), Fr. 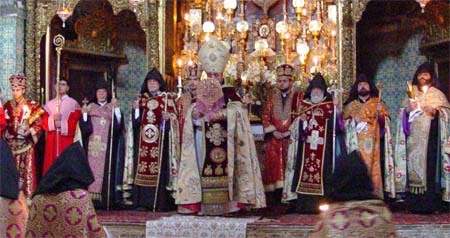 Madrios Chevian, Dean of the St. Vartan Armenian Cathedral on Second Avenue in New York City. He is a native New Yorker and I have enjoyed a few conversations with him over the weekend. He is here with a group of 60 North American pilgrims from both the USA and Canada, and is directing them in this photo to take their places for a final portrait at the entrance to the Patriarchate. Four of the clergy who have also come to Jerusalem as pilgrims for Orthodox Easter stand across from me in the great hall of the Patriarch's residence. All four are from Armenia, the monk on the left is completing work on a master's degree in Orthodox Theology in Athens, and Fr. Khoren is studying voice in Italy. 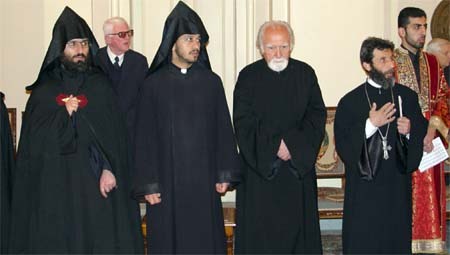 Next to them, two married priests the first (left to right) is the directory of the seminary in Holy Etchmiadzin, the "Vatican City" of Armenian Orthodoxy, home of his Holiness Karekin II, Catholicos of all the Armenians. Next to the venerable father, a parish priest from Yerevan, the capital city of Armenia. The many Armenian pilgrims present for the liturgy today, fill the back of the great hall. More than 700 Armenian pilgrims have come to Jerusalem this weekend, and most of them are on hand for the Badarak this morning. Finally this remarkable weekend of pilgrimage and paschal celebration draws to a close, and his Beatitude Torkum II, beloved Patriarch of Jerusalem (pictured left) offers his pontifical blessing.